On 1 December the INTA held it's winter black belt grading. The prestigious Radisson Blu Hotel in Cork was chosen to reflect the importance of welcoming new black belt to the Taekwon-Do family. The hotel's Great Island Ballroom was divided in two sections, and each section had tasteful festive Christmas Decorations. 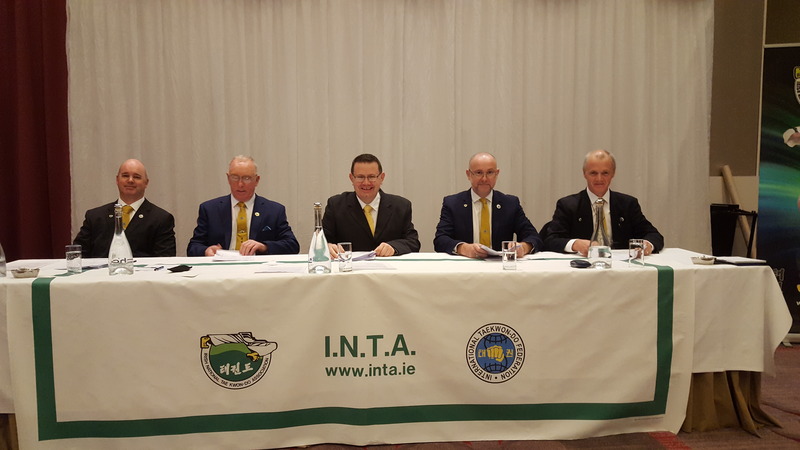 For the first time in the INTA's history, the grading panel for the first Dan consisted of five 7th Degree Masters; Master Donnelly lead the panel further consisting of Master Franks, Master Fagan, Master Stobie, and the recently promoted Master Troy. Registration for the 28 candidates for first degree started bright and early at 08:15 a.m. Master Donnelly held a short welcoming speech for all black tag students at 9 o'clock, and put them at ease, for as far as that was possible. The grading started soon thereafter, with candidates presenting themself in groups of four, for movements up and down the floor, patterns, step sparring and self defence. Thereafter was a short break in which students could put on their gear, and prepare for sparring. After some intense rounds, all students were tested individually for their theoretic knowledge of Taekwon-Do, followed by the dreaded power test. Meanwhile the grading for those looking to promote to 2nd degree and above started in the adjacent section at 10 sharp. 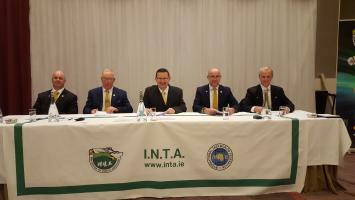 Here the grading panel was under command of the President of the INTA, Grandmaster O'Toole. By his side were the Vice President of the INTA, Master Douglas, and Master Martin, both 8th Dan. Six candidates for 2nd Degree were split in two groups and put through their paces, followed by two students hoping to promote to 3rd Dan. Finally two seasoned assistant instructors put themself forward in hope to be promoted to Sabum, who were joined by the Chief Instructor from Kildare Taekwon-Do, Mr Ng, 5th Degree, going for 6th. When all was said and done, both grading panels retreated for deliberations. A short while after, all candidates lined up in one hall for the presentation by Grandmaster O'Toole. For the first time in years, all those looking for promotion to 1st Dan passed. To many of the delighted new black belts, to whom I spoke to after, it seemed that Christmas had come quite early this year. Notably, one new black belt is just over 11 years of age. Unfortunately there were two students going for higher grades that failed this winter, and wish them all the best preparing for their repeat next summer. But, we are happy to announce that five students promoted to 2nd Dan; one as young as 13 (quite a feat!). Further there was promotion to 3rd degree, two new 4th degree instructors, and one promotion to 6th Degree. Congratulations to all who passed. Enjoy the celebrations!